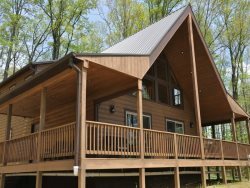 Here are the guest reviews and experiences while staying at Great Smokys Cabin Rentals. Contact us today to learn more about visiting beautiful Western North Carolina and staying in one of our vacation rentals. I was absolutely amazed by how clean the property was and I was really impressed. The view was also amazing. We had a great time! Thank you! Amazing property! Great views! Exceptionally clean! Responsive host and pet friendly! Win win win! The cabin is great with such an amazing view! The layout was perfect for multiple families to have their own space! We had a fun time in your Smoky Mountains! We loved the cabin! The front porch view and the cozy feel. It was perfect for our honeymoon. We had a wonderful stay. Great birthday get away! Everyone has been wonderful. I've rented with you twice and have been well taken care of and promptly responded to. The cabin was quiet and romantic. The GSCR team was great! Quiet and peaceful. This was perfect for our first anniversary. Absolutely everything about this place is awesome. We will be back. Romantic moments in the Hot Tub! Wonderful meals prepared outside. Gorgeous views. Next time we come, we will be sure not to make any plans and just stay right here in the PEACE and Tranquility!!! The cabin was great. The people at GSCR were excellent to work with. We went trout fishing, Our favorite was the surrounding beauty, comfort, beds, we felt right at home.